Seen at the James and Barbara Moore Observatory in Punta Gorda, Florida: a scope worthy of a quasar hunt. "How far can you see with that thing?" 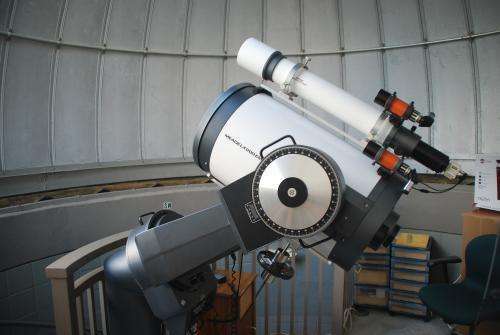 It's a common question overhead at many public star parties in reference to telescopes. In the coming weeks as the Moon passes Full and moves out of the evening sky, we'd like to challenge you to hunt down a bright example of one of the most distant and exotic objects known: a quasar. To carry out this feat, you'll need a 'scope with at least an aperture of 20 centimetres or greater, dark skies, and patience. Although more than 200,000 of quasars are currently known and they're some of the most luminous objects in the universe, they're also tremendously distant. A very few are brighter than magnitude +14, about the brightness of Pluto. Most quasars have an absolute magnitude rivaling our Sun, though if you plopped one down 33 light years away, we'd definitely have other things to worry about. First discovered as distinct radio sources in the late 1950s, the term 'quasar' is short for 'quasi-stellar radio source' and first appeared in a 1964 paper in Physics Today. The first quasar discovered was +16th magnitude 3C 48, and 3C 273 in Virgo is the most accessible quasar available to Earthbound amateurs. We now know that quasars are associated with extremely energetic galactic nuclei and were a common constituent of the early universe. When dealing with such stupendous distances, it's useful to refer to an object's redshift. Most quasars exhibit a redshift of 0.06 to 7.0, correlating to a distance of 600 million to 29 billion light years. Yes, that's older than the 13.7 billion age of the universe but remember, the cosmos itself has been expanding and accelerating in the intervening time. Through a telescope, a quasar will appear like an insignificant star-like point. You can be sure that we look even punier from the quasar's point of view. The biggest wow factor of the challenge is catching sight of a quasar at all! You'll need a good finder chart with stars plotted down to at least +14th magnitude to aid you in your quest. Many planetarium programs and star catalogs do not plot stars faint enough to be effective, though we can testify that Starry Night Pro worked well to track down 3C 273. The Sloan Digital Sky Survey (SDSS) can provide good target fields that you can invert (i.e. producing black stars on a white background) for use in the field, and sketching the suspected field of view for later comparison can bring out your quasar prey. Several caveats are in order: Navigating the database jungle can be a daunting challenge. Like stars, quasars are often known by multiple names across many catalogs, and cross-translational errors can creep in to tables to boot. Do you say Mizar, Zeta Ursae Majoris, SAO 28737, or HIP 65378? Quasar nomenclature faces the same multi-catalog dilemma. Many designations use a phone number-looking code that denotes the object's position in the sky in right ascension and declination, though even these may be off on occasion. And to top it off, many active galactic nuclei and pseudo-quasar suspect sources populate many compilations as well. 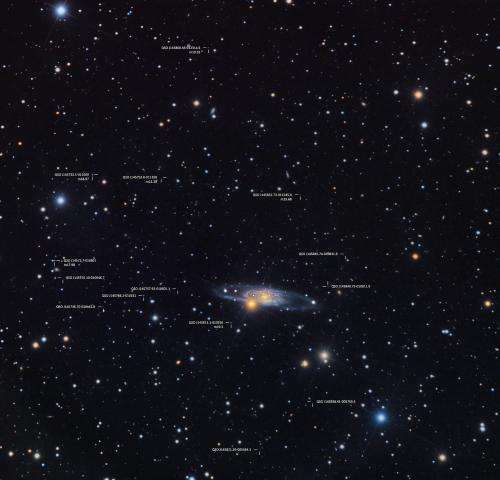 Observers will want to cross check many of the entries cited from various resources against the NASA/IPAC Extragalactic and the SIMBAD databases. Another fascinating sight in the constellation Pegasus sits below our +14th magnitude threshold and is known as Einstein's Cross. This is a distant quasar is segmented into four gravitationally-lensed components due to a foreground galaxy. 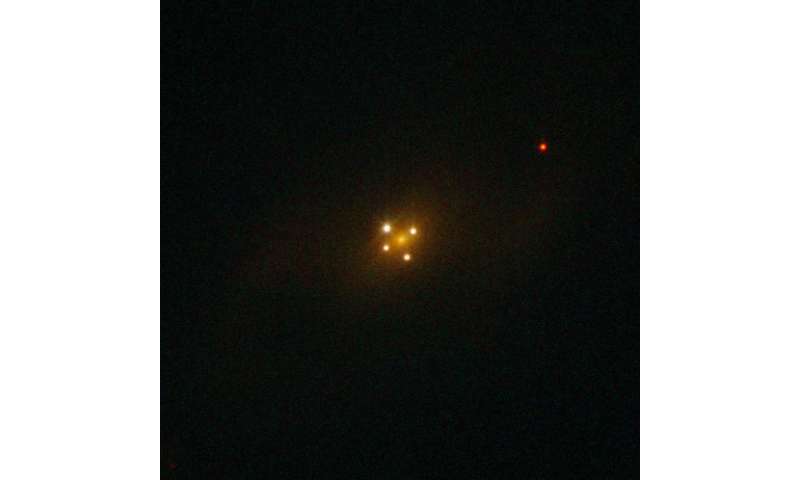 We've reliably seen two components of Einstein's cross exactly once through the Steward Observatory's 61" Kuiper Telescope at Catalina Station. You often hear that gravity bends light, but here is proof of Einstein's famous theory of general relativity in action! And amateurs have also even managed to nab and chart the redshift of 3C 273 as well. So much for the argument of "yeah but how do YOU know that the universe is expanding?" that often crops up at public star parties… amateurs have checked this out for themselves. The American Association of Variable Star Observers. A Catalogue of Bright Quasars and BL Lacertae Objects. 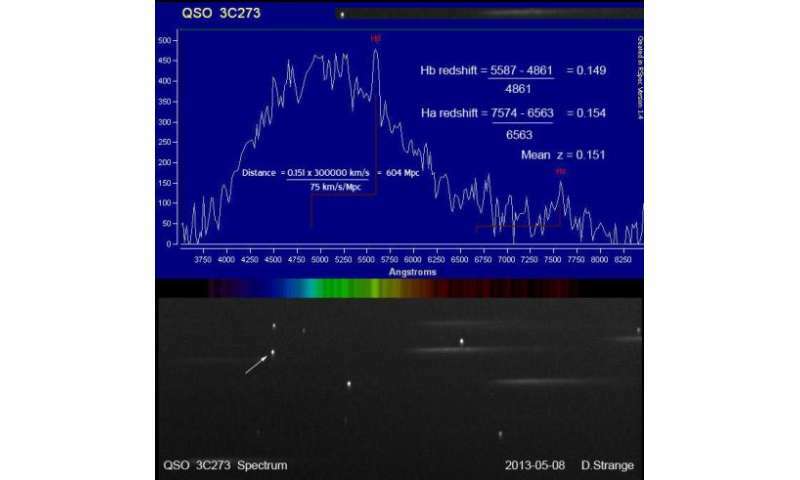 The Frankfurt Quasar Monitoring project. The East Valley Astronomy Club's Quasar observing program. Sky & Telescope also has an excellent article in its March 2014 edition on quasar hunting, and a good starting point article online. Perhaps you too will get bitten by the 'quasar bug,' and hunt for crosses, microquasars, BL Lacertae objects, Seyfert galaxies and more. 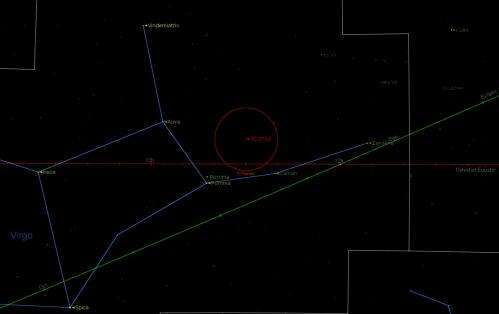 There's one more interesting challenge that amateur radio astronomers might want to try. 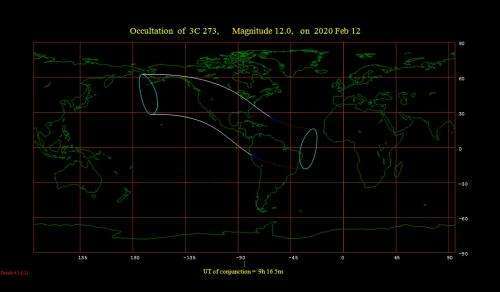 In the early 1960s a series of lunar occultations of quasar 3C 273 cinched its precise location. A new set of occultations begins in late 2017. This would be an outstanding observation for an advanced radio observer to replicate! Doubt I can see it from my light polluted backyard. -12 mag is very difficult but may try.